The aim of this chapter is to study the following themes. 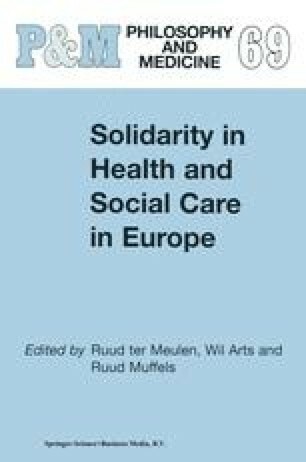 First, we study the evolution of health and social care policies in Italy, within the framework of the dominant solidarity model of the Italian welfare system. These policies are also examined with reference to the type of provision of health and social care services offered by the public sector, by the private sector and by the so-called third sector of voluntary intervention. Second, we focus on the evolution of the Italian welfare system starting with the introduction of the Constitution of the Italian Republic. Third, we examine the systems of health care funding, the provision of health and social services with implications for equity and efficiency; the organisation of both private and public health services within the health system. Fourth, we look at attitudes and opinions expressed by Italian citizens towards the health services and their willingness to contribute to the NHS, the level of satisfaction with NHS services and the preferences for a public or a private system. This has implications for questions dealing with territorial solidarity, with special reference to the Northern/Southem divide, as shown by different studies. Fifth, the public debate on main proposals to reform health and social care policies in Italy are dealt with.